More clever science experiments, funny jokes, and robot hijinks await readers in book four of the New York Times bestselling Frank Einstein chapter book series from the mad scientist team of Jon Scieszka and Brian Biggs. The perfect combination to engage and entertain readers, the series features real science facts with adventure and humor, making these books ideal for STEM education. This latest installment examines the quest to unlock the power behind the science of "all connected life." Kid-genius and inventor Frank Einstein loves figuring out how the world works by creating household contraptions that are part science, part imagination, and definitely unusual. In the series opener, an uneventful experiment in his garage-lab, a lightning storm, and a flash of electricity bring Frank's inventions—the robots Klink and Klank—to life! Not exactly the ideal lab partners, the wisecracking Klink and the overly expressive Klank nonetheless help Frank attempt to perfect his inventions. 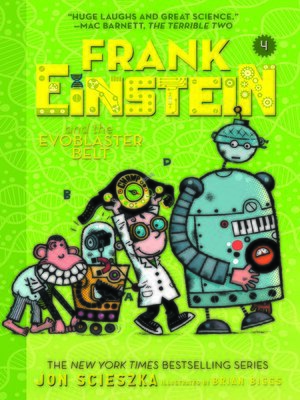 In the fourth book in the series, Frank—along with his best friend, Watson, and Klink and Klank—once again finds himself in competition with his classmate and archrival T. Edison and his sign-language-speaking sidekick, Mr. Chimp, over Frank's newest invention: the EvoBlaster Belt, which allows the user to evolve and devolve into other forms of life, blasting from one species to another.